(3) The purpose of baptism—for, in order to, unto the forgiveness of sins; to put one into Christ where all spiritual blessing are to be found, and to induct one into the body of Christ—the church purchased by his blood. “And now why do you wait? 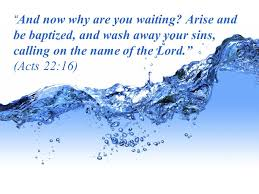 Rise and be baptized and wash away your sins, calling on his name” (Acts 22:16, ESV). “And he said to them, “Go into all the world and proclaim the gospel to the whole creation. Whoever believes and is baptized will be saved, but whoever does not believe will be condemned (Mk. 16:15-16, ESV). Paul was not saved before his baptism. Paul was a strict, zealous persecutor of the church and he thought he was doing the right thing. But he was lost without Christ. But, when he did what Christ commanded him to do by the preaching of the gospel, he was saved like everyone else then and like all are today.